Internet Explorer is an essential part of the Microsoft Windows operating system. It usually is the first browser there is and even if users switch to third party browsers it remains installed on the computer system. Several third party applications use Internet Explorer's rendering engine to display web contents in their interfaces which means that it is important to keep Internet Explorer up to date to avoid security and performance issues. PC users who work with Internet Explorer might experience a situation where they need to repair Internet Explorer. The browser might feel sluggish, display error messages, crash outright or may not start at all. The following tips may help users who want to repair Internet Explorer. The article concentrates on Internet Explorer 8 but most tips are also valid for previous versions of the web browser. The first thing you want to do is to take note of the problem. Is the browser starting up? Is it crashing? Does it display an error message? Is it slow? You may want to start with a thorough scan of the computer system for malicious software. Suggested security software for this job are Dr. Web, Avast or AVG. Make sure you perform a full system scan and clean any viruses, trojans and other malicious software from the system. Improperly configured security programs may slow down Internet Explorer, block it from accessing web contents or may be the cause for error messages that are displayed to the user. You may want to do something that is usually not suggested: Turn off the security software and test Internet Explorer afterwards. If the problems go away it is the software that is the culprit. You then need to configure the software to make it compatible with IE. Internet Explorer toolbars and add-ons. If you can open Internet Explorer you might want to check the installed add-ons and toolbars. Microsoft found out that Internet Explorer users run five to six add-ons on average. This can be attributed to software installations who often offer to install toolbars and browser plugins. 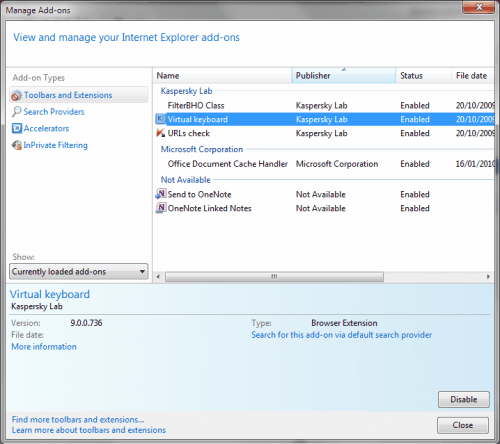 To manage the Internet Explorer add-ons open Tools > Manage Add-ons in Internet Explorer. This displays a new program window that lists all the installed add-ons in the browser. The add-ons are categorized by type in the left sidebar. Toolbars and extensions is the category that is displayed by default. Take a look at the add-ons in the list. You can disable add-ons by right-clicking on them and selecting disable from the context menu or selecting them and clicking on the Disable button in the lower right corner of the screen. You may want to start to disable add-ons that you do not recognize. A direct approach would be to disable all add-ons and see if that helped solve the problem. If it did you may return to that window and gradually activate add-ons again one by one until you find out which add-ons have been responsible for the issues. Click the Start button Picture of the Start button, click All Programs, click Accessories, click System Tools, and then click Internet Explorer (No Add-ons). Chance is you may be running an old version of Internet Explorer. If you are running Internet Explorer 6 or Internet Explorer 7 you may consider upgrading to Internet Explorer 8 to see if this resolves the issues. Internet Explorer 8 can be downloaded directly from Microsoft. 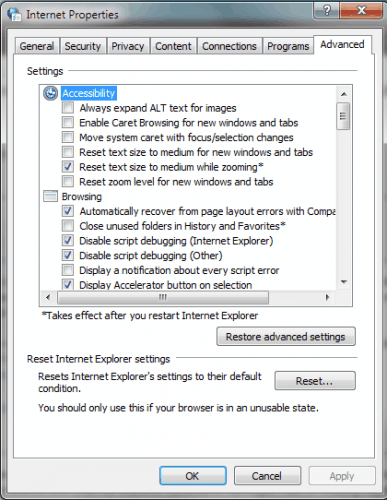 Resetting Internet Explorer's settings may work to fix the issue as well. You do not need IE open for this. In Windows 7 open the Control Panel by clicking on the start orb in the lower left corner and selecting Control Panel in the start menu. Now click on Network and Internet and then Internet Options to open them. This menu can also be used to manage the browser add-ons of Internet Explorer. Clicking on Internet Options opens a new window. Switch to the Advanced tab and press the Reset button at the bottom of the screen to reset all Internet Explorer settings to their default condition. If the tips above did not solve the issue you are having with Internet Explorer you may want to follow the links below to Microsoft support pages that contain further information on how to repair Internet Explorer to resolve issues one has with the web browser. Are you currently experiencing problems when working with Microsoft's Internet Explorer? Or have you experienced problems in the past and managed to resolve them? Let us know in the comments. Had serious issues recently with IE, mainly after installing things like IECollection or – lately – Offfice 2010 (Click-to-Run). Although every advice you give here is quite useful, none of them was helpfull at the time. So let me suggest a wonderful toolbox called Dial-a-fix which contains – among many things – an option to repair IE which successfully took me out of the woods. Though Dial-a-fix is a good tool and can be widely used for repairing Internet Explorer but it is limited till IE7 as there are many DLL files of Internet Explorer 8, that cannot be re-registered by using it. Also while using Dial-a-fix on Vista, you will have to use its Windows XP compatibility mode . Here’s a sure-fire way to repair Internet Explorer – download Google Chrome! The very 1st step is to delete all Internet temp files. Use Internet Options or the excellent CCleaner. Thank you for sharing this great guide on repairing Internet Explorer! I am sure many users will find this helpful! Are you a member of the community of IE users over on Facebook? If you are really keen on using IE then at least download another browser SOON so that when IE stops working you can get some online help. I am running windows vista, I have tried to upgrade to IE9. When I go some websites that I have to loggin to, the top portion of the web page is no longer visiable…… any sugesstions out there….. Try clearing the cache, check if compatibility view is on, try loading the site in a different browser to see if the websites display fine in that other browser. My internet explorer is shutting down immediately when it is open, please suggest me how to repair it. I am running Windows XP Home Edition 2002 Service Pack 3 and unable to launch Internet Explorer. When I try to launch it from the shortcut or from the exe file it displays Windows cannot access the specified device, path or file. You may not have the appropriate permissions to access the item. It’s not a permissions issue. I can not launch IE at all. Not even in Safe Mode. I wanted to just remove it and re-install but that has failed also. I can’t remove it as it doesn’t appear in the Control Panel>Add/Remove Programs and just deleting the folder was a no go as well as it appears it is an essential item. I tried to repair it by re-installing from Microsoft site but that fails as well and just puts a Troubleshooting IE link on my desktop that I can’t open with IE since it doesn’t launch. I have the old installation disk and tried to use that to install Windows components but that didn’t work either. I can use other browsers, Safari and Firefox, just fine to access the Internet. I would really like to get IE repaired though. Any ideas? YOUR ARE REQUEST MAY KINDLY BE MY PROBLEMS SOLVE THEM MY HOTMAIL / WINDOWS ERROR ON PAGE IN OPEN OF HOTMAIL BOX NOT WORKING THIS TIME TO CHANGE REPAIRS REPAIR INTERNET EXPLORE PLEASE ANY OTHER TECHNICAL PROBLEMS TO SOLVE THEMS PLEASE TO oBLIAGE PLEASE THANKS BEST REGARDS .S.M.FAREED GOD BLESSING.TO REPLY PLEASE. Thanks for this post, i will try this. If we stopped using Microsoft software to run our websites, we wouldn’t deal with the garbage of IE. I use IE sometimes and knowing how to deal with its issues is appreciated.